In this “best of” minorities in cartoons entry, I’ll look at how various minority characters have celebrated or been involved with Thanksgiving. This 1972 “Peanuts” special features Franklin. This one’s memorable just for the fight between Snoopy and the lawn chair, plus the snack food Thanksgiving meal. This 1972 Hanna-Barbera special depicts the animation studio’s own retelling of the first Thanksgiving. The Native Americans shown here are less stereotypical versus depictions in pre-1970s cartoons. I don’t know about its TV incarnation, but “The Boondocks” comic strip did a few entries about Thanksgiving. The strip had a week-long story playing on Huey’s paranoia, this time about what’s “safe” to eat. Apparently buying an organic/free-range bird didn’t occur to Huey or Granddad. Of course, I’m sure Huey would’ve found flaws with that as well. The 2000s comics attempted to create a new JLA/JSA team-up tradition: an annual Thanksgiving dinner held by both teams. This started with 2003’s “JLA/JSA: Virtue and Vice.” Mister Terrific was of course one of the JSAers taking part. 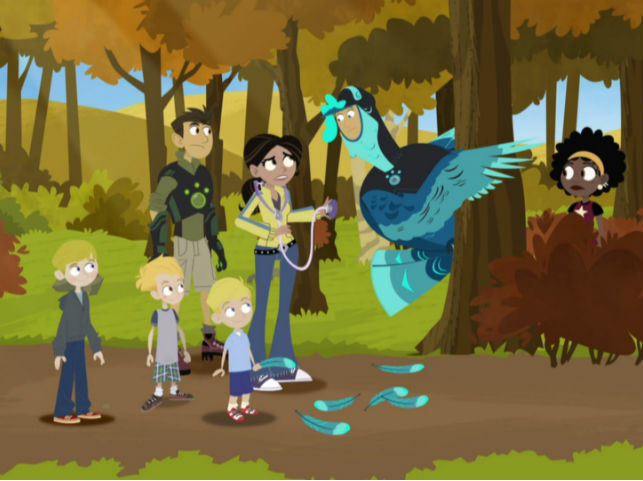 “Wild Kratts” featured a Thanksgiving episode, “Turkey Day.” The gang thwart Gourmand’s attempts to hunt for a wild turkey to eat. This unfortunately happens to include Martin, who’s stuck transformed into a turkey. An early episode of “Total Drama Island” featured Chef serving a huge Thanksgiving-style meal to the contestants, including a turkey. This was all an attempt to make everyone sleepy in advance of that episode’s contest: to see who can stay awake the longest. Since the show takes place in Canada, their Thanksgiving wouldn’t be until mid-October, specifically, the second Monday of October.